Enjoy the Golden things in life. 10th july to the 12th july, Golden, BC. We’re excited for the third year of All Things Golden! Join Mountain Bike and Yoga Certified Instructors, Jeff Mah and Audrey Duval in Golden BC, for a long weekend of guided mountain biking crowned by two delightful yoga class per day. This weekend is all about improving your skills to become a confident, smooth rider. You will leave the retreat with new friends, new skills, and more tools to keep your body strong. 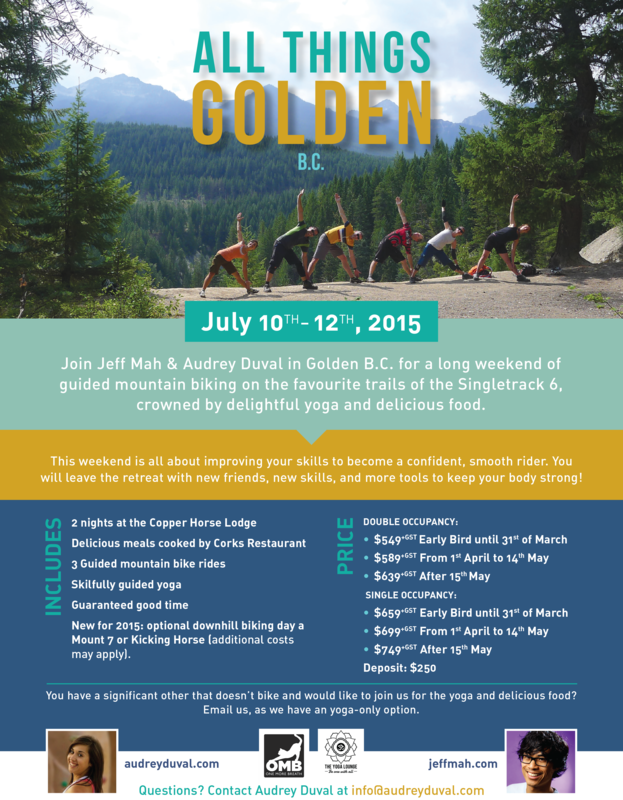 Our skillfully crafted yoga sessions will target areas challenged by mountain biking; while the trail networks of Golden, BC assail you with memorable moments. All Things Golden is a weekend to remember. Our relaxing schedule allows for plenty of time off both the mat and the bike. Consider treating yourself to a massage, go to the beach, keep riding, or indulge in a good book. Illustrious food and lodging brought to you by The Copper Horse Lodge and Corks Restaurant. Three guided mountain bike rides on Golden’s Moonraker, Shadow Mountain trail networks and an one day option to go downhill biking (additional cost may apply). You have a significant other that doesn’t bike and would like to join us for the yoga and delicious food? Email us, as we have an yoga only option. Our retreat has limited space, make sure you book your space early as 2014 sold out. To ensure quality guiding and instructing, we believe in adhering to a 1:6 instructor to participant ratio to maximize your enjoyment and progress. We look forward to share this precious moment with you!